It’s confession time. I read the entire Twilight series. I read the first book many new moons ago and seriously, it almost made me barf. I literally skipped entire pages devoted to people staring into each others eyes. I couldn’t take the nauseating details exclaiming the beauty of a completely insincere romance. Tiny Small As The Vampire Baby. Real romance is when your husband washes the dishes, cleans up the dog poop (so you don’t have to) and lets you sleep in an hour later because you stayed up all night with the baby. All of the lustful, eye staring made me cringe and want to set the book on fire. I guess, if you are a vampire and live for infinity, 30 pages devoted to googly-eyed staring passes by in the blink of an eye. For me, a mere mortal, reading all of that felt like an eternity. I could literally hear the seconds of my life ticking by with every romantic gesture and glance. Minutes I would never be able to get back. It was a miracle that I finished it at all. I didn’t read anymore of the series until recently when, even though I had sworn on a grave or two that I would never ever read another Twilight book, I read the rest of the series all in one week. What broke down my resolve? I can only blame Jim because, as it turns out, I usually blame him for everything anyway. Seriously though, this time it really is his fault. I started reading the books again after Jim told me that people were having seizures in the movie theater when the vampire baby was born. Vampire baby? Wait…what?! So, I trotted down to the library and checked out the rest of the books and to tell the truth each one got less sappy and more interesting than the previous one and by the end of the last book I was a little sorry it was all over. Only a little sorry though. I want that on the record! 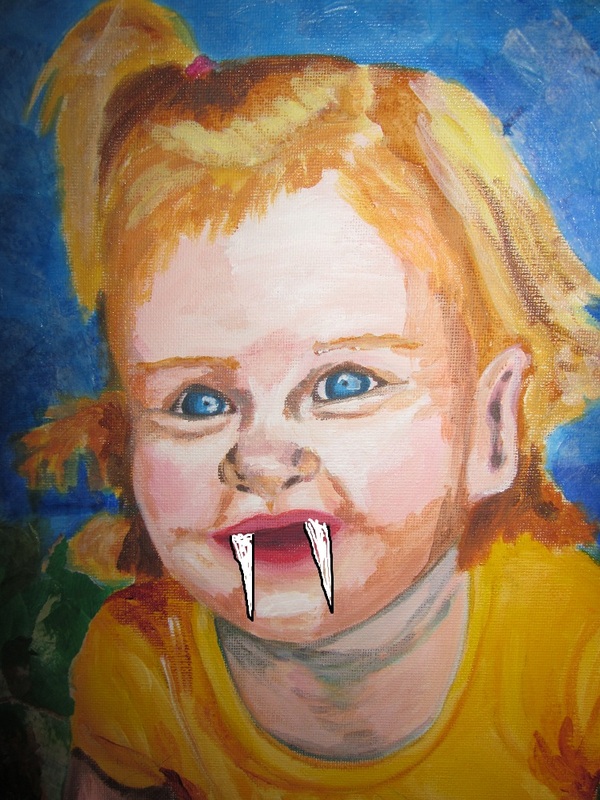 Having said something nice, now I have to scream, “Vampire BABY!!?? Come on!” Vampire’s can’t have babies. They are dead. Dead people don’t have babies. It’s like the author never read up on vampire lore or something. It’s like she never explored the not-so-secret manual to the undead. It’s like she got her super-human, mythical creature villans mixed up or something. Even though I would like to continue ranting with all of my vampire-nerd outrage, I have yet another confession to make. Rosie. We Should Have Named Her Fangs. When my daughter was born I called her my little “milk-vampire” because she sure acted like one. There were certainly days where I felt like a vampire victim. Even now, when she gets really frustrated, she will turn and bite something. She’s gnawed on her highchair, the table and a few stuffed animals more times than I count. I was bitten more than once myself, but I never turned into a milk-vampire or an ordinary vampire or a hybrid vampire. 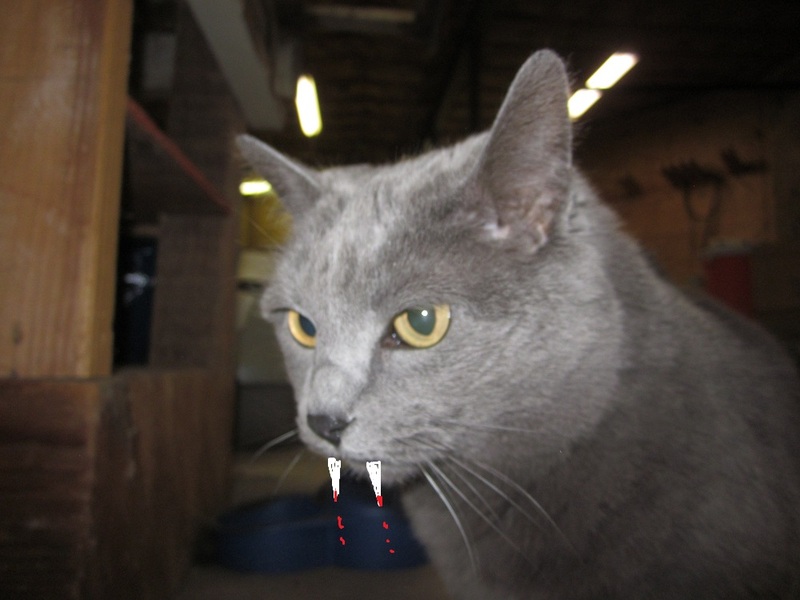 In another weird coincidence I was attacked by our cat, Mik-Mok, vampire style, but I never turned into a werecat either. It seems I have some natural immunity to all creatures of the night time or daytime for that matter. The books did get me wondering about why so many people (and animal) in my family have vampire-esque tendencies though. It would certainly explain the desire to stay awake all night. The long naps during the day. My daughter’s aversion to vegetables and her love of the color red. It would explain why Mik-Mok is always killing mice instead of humans (she’s obviously a vegetarian type) and why my husband is always feeding me large quantities of garlic. I think he knows something that he’s not telling me. He can keep his secrets. As long as he doesn’t force me to stare into his eyes for long periods each day I think we’ll be OK. We can make this work as long as Mik-Mok doesn’t lose control of herself…at least not again. P.S. I’m totally Team Werewolf. How about you? It’s been snowing. It’s been snowing all day long. 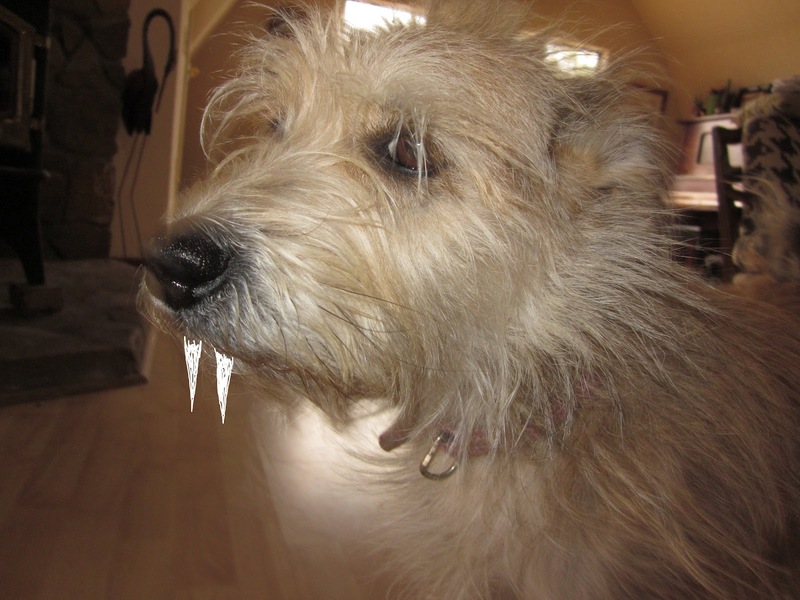 It’s been snowing all day long and I have been trapped inside with one crazy puppy we call Lucy, Lulu and often Loco. She is also referred to as Psycho, Whacko, Lucifer and “No, Stop that.” My daughter has heard the word psycho in reference to this puppy so many times that she actually named her stuff dog “Psycho arf-arf” and has started calling people being silly “loco.” Lucy is a natural herder and really needs a job (we will be getting chickens in April) because during the day she periodically bites my ankles and tries to drag me around the room by my pant legs. I don’t know where she thinks I belong, but I often fantasize that she will drag me to bed and perform guard duty while I take a nap. This never happens though (much to my dismay). Most of my pants now have teeth marks and holes in them. I am just grateful that they are on the back of my pant legs so I don’t have to look at them and can pretend they are not there, much like I do with the back of my hair when I only have time to make the front look good. Lucy and my daughter are as thick as thieves always plotting to perform some unfortunate event that usually involves food (dog or human), water, and anything chewable. I recently found Lucy and my daughter curled up together on the dog bed. My daughter was, of course, chewing on Lucy’s bone and Lucy was eating cheerios right out of a nice clean bowl. Lucy has tried to jump into the bathtub and has, on occasion, walked right into the shower with us. My daughter likes to play weights and measures with the dog water pouring it from one container to the next until the floor is soaked and so is she. Sometimes, my daughter will carry the bowl of dog food around and dole out one piece at a time to the eager Lucy. This is the same food Lucy will refuse when I pour it into a bowl for her. Who knew that an almost 20 month old child could master the concept of supply and demand so quickly? Lucy is not the only trouble maker living in this house. We also have a horribly vicious cat named Mik-Mok that actually tried to kill me once. I am not being dramatic. That cat has me on some sort of “people I’d like to kill” list. One minute she was sitting on my lap purring and the next minute she was attacking me vampire style. She left two holes in my neck (claws) and bit my chin (teeth). This was during the Obama inauguration. I am not sure why that fact is important except that now I respond to Yo-Yo Ma like a B.F. Skinner research participant. Mik-Mok or “Mickey-Mok” as my daughter calls her now lives in my husband’s shop where we have very supervised visitation. I posted a picture of her at the top of this blog post because I once read that people like pictures of cats. I’m not sure she will increase my blogging popularity, but she might attract some curious bystanders much like a terrible auto accident does. Some things are so scary you just can’t look away. Maybe once they see her they will stay and read my blog.